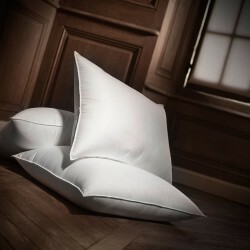 The ergonomic pillow is a pillow for resting the neck. This is a pillow usually made of injected foam. Today, we do not realize ergonomic pillows, preferring to offer products that are totally adapted to your body type and sleeping habits. 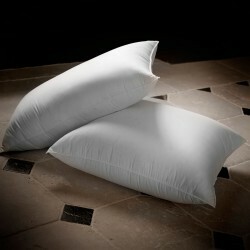 Our pillows are made of superior materials, in synthetic or in down. We offer a pillow made for you, meeting a level of quality guaranteed by a century-old know-how and a perfect knowledge of the scientific conditions of a good sleep. If you sleep on your back, you need a firm pillow that holds your neck and cervical. If, on the other hand, you sleep on your stomach, your spine and cervical should not be under tension. A fluffy pillow is more suited for people sleeping on the side. For a totally personalized pillow, we invite you to complete the short questionnaire 'your ideal pillow' (hover over the 'pillows' section of this website), to determine the one that suits you best. 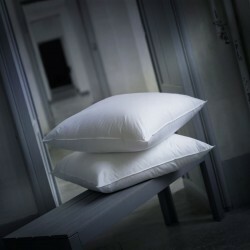 We also make custom-made pillows within 10 days, with the dimensions you want: we can not make a pillow more ergonomic ! 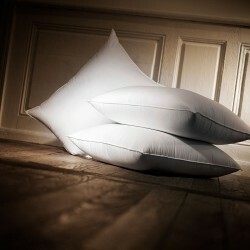 The delivery terms for a custom-made product are the same as those for a standard pillow. Nevertheless a custom pillow can not be returned. For people allergic to dust mites, we apply our GSD® treatment on demand: a unique method against bacteria that helps limit allergies.